My dog is Barking .... Help! Barking is a normal canine behaviour and serves primarily in communication. Unfortunately this normal behaviour is often not well tolerated in todays cramped city style living. People have been faced with eviction and even been forced to relinquish their canine companion due to barking dog complaints. Are you aware of your local council laws? Normal dogs will bark for a variety of reasons including communication, boredom, excitement, distress, fear and anxiety, territorial defense (warning), frustration, cognitive decline (dogzheimers) and stereotypic behaviour. Genetics also play a role in barking. Some breeds are more adept and predisposed to barking than others. Consider what your dog was bred for – terriers were often bred to chase vermin underground. These little dogs posed the risk of occasionally becoming trapped in the underground network of burrows. The dogs that barked were found by their owners and dug out to safety. Consequently, these dogs were also the dogs that bred and passed on the genetic woofing component. 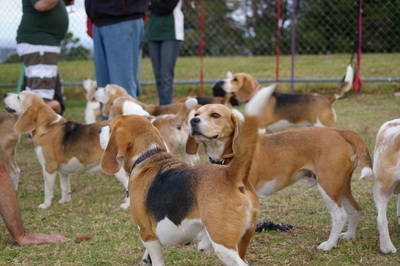 Beagles are another dog that were bred to bark. The distinctive bay of a scent hound is unmistakable. There are some rare and complex disorders that can lead to barking, including compulsive disorders, and barking secondary to separation anxiety. It is therefore vitally important that we look at the big picture to identify some or all of the factors that are contributing to your dogs barking. Where is the dog when the barking occurs (at the front fence, in the back yard, when out on a walk etc)? When does the dog bark? This means exactly that, what time of day is it when the dog barks, how long does it last for and how many times does it occur? You can download an app for iPads called Bark’n Mad – the app is capable of recording all day with little use of battery and will time stamp episodes of barking. You will be able to tell what was occurring at the same time. What is the dog barking at or for? What else is your dog doing at the same time? Is he running up and down the fence, standing stiffly, cowering, toileting, playing? It is a wise idea to keep a Bark Diary. In this diary you should record the date, the time of day each barking episode started and finished, how often these occurred, where was the dog, what was he barking at, what was the dog doing. Assess why your dog is barking. If your dog is barking due to boredom increase his daily jobs. Get him working and earning all food and rewards (including attention). Ask for the NILIF (Nothing in life is free) hand out. Give him food dispensing toys instead of feeding from a bowl. Train him basic behaviours and when you have mastered them, move on to the harder and trickier things. Observe your dog for body language that may indicate fear. Where are her ears, is she looking away, are her pupils dilated, is the body crouched low, tail tucked and weight more on hind feet. Is she yawning, lip licking or shaking off as if she has been wet? Refer to the Canine Body Language page. Does your dog bark at people as they approach your property. Property includes your house (possibly the whole street), your car, your bag etc. Your dog barks for food, attention, toys, to be let inside or let outside. The dogs’ barking usually increases until the desired effect has occurred. Dogs will often bark in play (be it with another dog, pet, person, alien (just checking you are still reading) etc). Many dogs will bark in response to other dogs barking. This is also known as bark pong. Make sure your dog has plenty of physical activity and mental stimulation! I honestly can’t stress the mental stimulation side enough. Avoid allowing your dog to practice barking- remember practice makes perfect, and in this case, I’m sure you wish your dog wasn’t perfect at barking. Avoid situations that you know will cause your dog to bark. Teach your dog some alternate behaviours that you can use to easily interrupt the undesired barking behaviour. Come When Called – teach your dog that come means come – do this using only reward based training methods and practice in low arousal situations before needing this in a high arousal situation. Rewarding your dog for coming when called (bring them inside or remove them from the environment in which they were barking) is not rewarding for the barking. By calling your dog, you are able to remove them, rather than chase them around as is often an alternative for many people. Target – teaching your dog to target (touch) his nose to your hand is one of the most useful behaviours you can use. Not only does this interrupt the barking, but will also deliver the dogs attention back to you. Shush - capture quiet - reward your dog when they are doing the right thing. You can even train it on to a cue. Your dog is trying to alert you to something, but you haven’t responded. 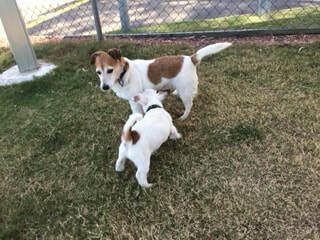 The dog is intermittently rewarded for the barking (kind of like the poker machines), if sometimes you look at, talk to, feed or touch your dog during a barking episode this can quickly become a learned behaviour – this attention seeking can then turn into a game. Instead, redirect your dog into a desired behaviour. How about some mat or crate (providing trained appropriately) time with a long lasting chew. Chewing will release endorphins and how to calm your dog. You bark too. If you yell at your dog for barking, in the dogs eyes, you have just joined in the barking with him. Woof Woof Woofety Woof. There are various designs of barking collars including sonic (high pitched sound), static/shock (administer an electric shock to the dogs neck) and Citronella (spray citronella when the dogs barks). Barking collars act against the RSPCA Five Freedoms – As all of these collars will cause discomfort, and can cause pain, fear or distress. Barking collars can result in injury to your pet. These collars can also result in the dog associating the pain or discomfort of the Collar with what they were barking at. Imagine your dog barks at people. He now receives a shock when he barks at people. This does not teach him that people are good. In fact, it may teach him the opposite, now people approach he barks and he feels pain. This can result in your dog learning to fear or dislike people. Next time a person enters your property, the dog may feel it is unable to bark to let the person know of their fear – your dog may now bite someone. I would never recommend the use of these collars or use one on my own dogs. In 2013, Defra (Department for Environment, Food and Rural Affairs – UK) published two studies which showed that electric shock collars can cause some dogs negative welfare issues even when trained by a professional using 'relatively benign training programmes', so therefore many would deem them unsafe. "... As a dog will have no idea what has caused the pain, it is far more likely to associate it with something in its immediate environment than to connect it with its own behaviour at the time”. "This is why cases of dogs attacking other dogs, their owner, or another animal close by at the time of the shock are common." “Dogs wearing shock collars can suffer from physical pain and injury (ranging from burns to cardiac fibrillation) and psychological stress, including severe anxiety and displaced aggression. Individual animals vary in their temperaments and pain thresholds; a shock that seems mild to one dog may be severe to another. The anxiety and confusion caused by repeated shocks can lead to changes in the heart and respiration rate or gastrointestinal disorders. Electronic collars can also malfunction, either administering nonstop shocks or delivering no shocks at all”. Electronic collars have been banned in Wales, Quebec, New Zealand, Switzerland and some parts of Australia. 1. Aloff, B., 2001. Positive reinforcement. 1st ed. Neptune City, N.J.: T.F.H. 2. Antoniak-Mitchell, D., 2013. Terrier-centric dog training. 1st ed. Wenatchee, Wash.: Dogwise Pub. 4. Miller, P., 2008. The power of positive dog training. 1st ed. Hoboken, N.J.: Wiley Pub. 5. Overall, K., 2013. Manual of clinical behavioral medicine for dogs and cats. 1st ed. St. Louis, MO: Elsevier. 6. PETA, (2014). Electronic Fences and Shock Collars. [online] Available at: http://www.peta.org/living/companion-animals/caring-animal-companions/dogs/electric-fences-shock-collars/ [Accessed 29 Jun. 2014]. 7. Robinson, A. (2014). Electric Shock Collars 'Should Be Banned'. [online] Sky News. Available at: http://news.sky.com/story/1199078/electric-shock-collars-should-be-banned [Accessed 29 Jun. 2014]. 8. Rugaas, T., 2008. Barking. 1st ed. Wenatchee, Wash.: Dogwise Pub.